Offering you a complete choice of products which include poddar women's footwear and poddar ladies designer slipper. 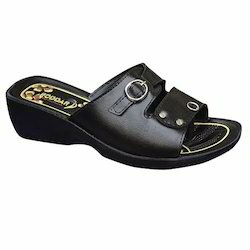 Reckoned in the industry a manufacturer, supplier, and exporter, we are engaged in offering Ladies Sandel. We offer these slippers to our customers in different sizes, colors, and patterns as per their requirements. Dispatching these products to the clients' premises in committed time-period, we have mustered huge client-base. Being a client centric firm we are involved in manufacturing, supplying and exporting a wide range of Ladies Footwear. We manufacture these by utilizing advanced techniques and using the high-grade material in compliance with current trends in the market. Offered Ladies Footwears are widely used and well known in market due to their reliable nature.